At Ray White Sippy Downs, we are the industry leader in the area for professional Property Management. We have a proven record of success and manage an impressive portfolio of properties. Below we have simplified the renting process by identifying some important information for you. This is your go-to reference guide for renting a property through Ray White Sippy Downs from start to finish. For more information on the application process, visit our Tenancy Application Page. At this stage, each person that wants to reside at the property would have viewed the property and completed a Tenancy Application Form. If you are moving interstate or overseas and are unable to view the property, you must sign an Agreement to Take the Property on Sign Unseen Form. When you return the application form to our office, please ensure that all information has been filled in correctly and that you have attached supporting documentation including photo id (driver’s licence/passport) and proof of income (pay slips/centrelink statement/bank statement). Should your application be successful, you will be required pay 2 weeks rent to secure the property and a full bond equivalent to 4 weeks rent. Please ensure you have these funds available. Prior to collecting your keys, you will be required to pay a full bond. This is equivalent to 4 weeks rent and must be paid in cleared funds. Unfortunately, our office does not accept bond transfers. It is your responsibility to arrange for all services at the property to be connected in your name and to have these disconnected prior to vacating. We offer a free service from Direct Connect that takes the hassle out of moving by arranging all of your connections. Your Property Manager can arrange for this on your behalf, or your can contact then directly on 1300 664 715. It is your responsibility to arrange for contents insurance at the property. Contents insurance is very important as it ensures you are covered in the event of an emergency or break in. Our office is open weekdays 8.30am – 5.30pm and Saturdays 8.30am – 2.00pm. Should you wish to see a Property Manager, please contact our office to set an appointment time. Each tenant will be provided with a set of keys ready to collect from our office along with a copy of the Entry Condition Report at the start of the tenancy. We also keep a spare set of keys in the office. Should you lose your keys or lock yourself out, you may collect our set during office hours. After hours, our recommended locksmith can be contacted at your expense – Abetta Mobile Locksmith 5443 7245. This is the binding document outlining the condition of your property and is a very important form when moving into a rental property. It must be filled out by both the Tenant and the Agent to ensure both parties agree on the condition of the property. We supply you with the Entry Condition Report at the start of the tenancy and you have three (3) business days to return the completed condition report. Only the people originally noted on your application form, tenancy agreement and who are approved by the owner may reside at the property permanently. If a new tenant wishes to replace an existing tenant, you will need to fill out the Change of Shared Tenancy Forms. Please return the completed forms to our office along with a copy of the new tenant’s application. 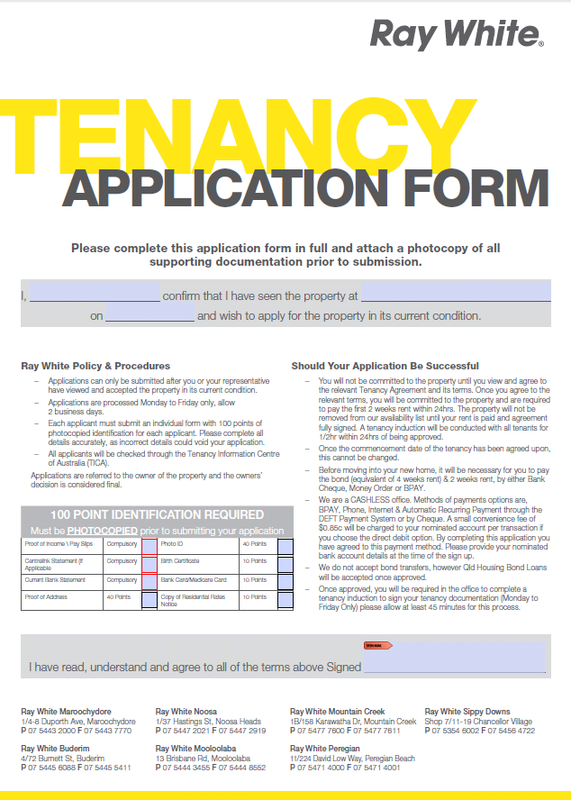 Click to download the Tenancy Application Formhere. Please refer to ourPaying Your Rentpage for more information. Bpay is our preferred method for rental payments. You will be supplied with the Biller Code and Reference Number during your Tenancy Induction. If you have forgotten these details, please contact our office on 07 5445 6088. The tenant agrees that no nails, screws, hooks, blue tack, sticky tape or tacks are to be fixed to the wall without written permission of the Agent. Please see our Maintenance Request Pagefor more details. It is strictly office policy that all maintenance requests are submitted in writing with as much detail as possible so we can act accordingly. You can complete an Electronic Maintenance Request Form at the bottom of this page, or download aMaintenance Request Formand return to our office. Please view our Emergency Repairs Page for a detailed description of what is considered an emergency and a list of tradespeople to call. As stated in your Tenancy Agreement, you are responsible for maintaining the lawns and gardens at the property unless otherwise stated. This includes watering, weeding, trimming and mowing. Seek advise from your Property Manager before removing any plants or pruning large bushes/trees, and make note of any relevant water restrictions. We are happy to recommend a garden maintenance tradesperson if you prefer and at your own expense. Unless a pet has been specifically approved in your Tenancy Agreement, pets will not be allowed at the property without prior approval. Please note that in the majority of unit complexes, the Body Corporate do not allow pets. If you wish to keep a pet at the property, please download a Pet Application Form here. Please see our Routine Inspections Page for more information. We carry out routine inspections at all our properties approximately every 3-4 months and will advise you in writing at least seven (7) days prior to the inspection. These inspections are always a good opportunity to point out any maintenance issues or other concerns you may have. 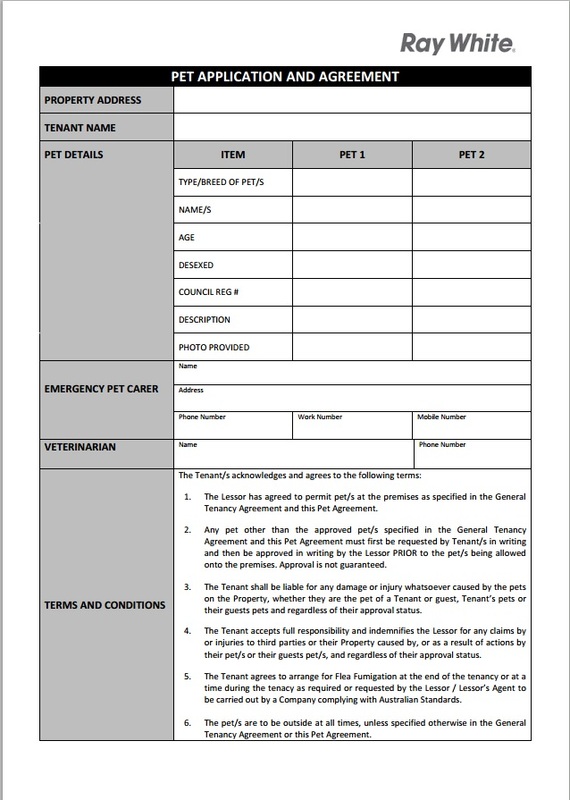 Download the following forms – Agreement to Terminate Fixed Term Lease and Notice of Intention to Leave Form. 1. The tenant is responsible for and must pay rent until the property is re-let to a suitable tenant through our normal office procedures for re-letting; or until the end of the Tenancy Agreement, whichever is sooner. 2. The tenant must pay a break lease fee, equivalent to one (1) weeks rent plus GST. The tenant must also pay for any advertising and administrative costs. If during your tenancy the property goes up for sale, you will be advised accordingly. If you are under a fixed term lease, you remain in the property for the term of the lease. If you are on a periodic lease (month to month), the Agency must provide four (4) weeks notice to vacate the property once the property has been sold. If you do not wish to renew your fixed term lease or continue your periodic agreement, you are required to give notice to vacate in writing on the Notice of Intention to Leave Formand hand a copy to our office. A minimum two (2) weeks written notice is required. As you would expect to enter a new property with a high cleaning standard, we too expect the property to be left in that same high standard, obviously taking into consideration the entry condition report. Click to download our Bond Saver Checklist for helpful cleaning tips. More often than not, tenants are required to return to the property after vacating to attend to outstanding cleaning items, which delays the bond refund process. We strongly suggest employing professional cleaners who can complete the work that would normally take days, in just hours, so those extra days spent on rent to clean could go towards a cleaner. This will save tenants both time and energy that could be put towards getting settled in to their new home.